While on first glance you may think this is the wrong season for this postcard, think again. This is actually exactly the right time of year to go skiing in Portillo, in the Chilean Andes, as it’s now winter in the southern hemisphere and you can enjoy the powder snow there each year from June to October! I spent a fantastic month in Portillo working as a receptionist at the resort’s only hotel during my Gap Year. I actually flew out to Chile a mere 3 days after turning 18, and it was my first solo trip to another continent. I arrived petrified, but within 48 hours I was having a whale of a time – the resort has an incredibly friendlyatmosphere and the other staff were very welcoming, particularly to someone so young and relatively clueless at that point. The resort is made up of a combination of exclusive chalets, one main luxury hotel, a medium-priced en-suite lodging option for groups of 4, and a truly budget option with shared bathrooms. It’s a perfect set up, as even backpackers can afford to ski here – it’s not at all like some resorts that are prohibitively expensive. It ranges from $12,400/week for one of the nicest Chalets in High Season, to $890/week for a bed in the budget accommodation in Low Season, and this price includes all your food and your lift pass as well. (To a non-skier this may look expensive but in all honesty it’s really not). And I haven’t even mentioned the snow conditions yet! It is easily the resort where I’ve had my best ever days skiing. The hotel itself is at 2,880 metres above sea level and and all the slopes are above this – this means they get a lot of snow. The resort is renowned for its off-piste and has a whole host of celebrities, famous skiers and even national ski teams come to ski there. In this postcard you can see the Laguna del Inca, a lake that’s frozen over in winter and which you can ski down to via numerous off-piste runs. 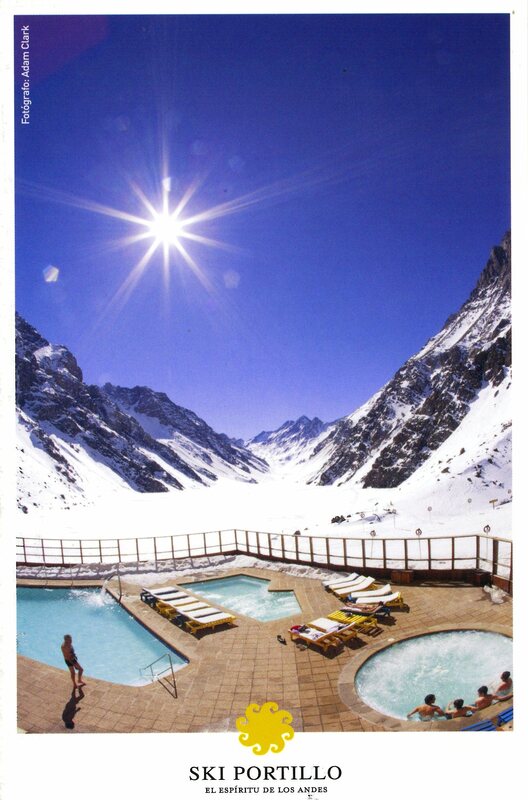 And then after a hard day’s skiing you can relax your muscles in the various pools overlooking the sunset…. What could be more perfect? There is so much more I could say about Portillo, which I’ll do in another post, but I will leave you with some photos from my month there and of some of the amazing people I met there. Amazing pictures! It looks like a great place! Ooh wait, edit, there seems to be something up with your like button on the link? Nothing is happening? It is stunning there… I wish I could go back every year but it’s a long trip from the UK! So did you manage to find the page to vote? Thank you if you did! If not then please try again – I’d really appreciate it! Yes I found the page. I’m on it now, I may be completely dense but there is no ‘like’ button to click showing up?